While last night’s premiere may have been more fun than anticipated, that by no stretch of the imagination means I wasn't grateful for an abbreviated version tonight…especially when this episode effectively took the fizzy energy of the premiere and let the air out. Was it Carson? His hosting duties did alternate between cuing up sad contestant montages and looking at family slideshows on the Sprint Not an iPhone Not Yet an iPad. But Carson has never has much to do but sympathize before the live shows start up, so a dull r can’t be his fault. Was it the judges? They still felt all sorts of hilarious feelings for this new batch of contestants. They still threw tantrums at each other. Adam and Blake still engaged in playground politics; Blake even compared winning last season to winning a high school pennant, because he’s Blake Goshdarnit Shelton, goshdarnit! CeeLo still tried to trick a woman into thinking she was already married to him, because she was beautiful, they were both wearing white, and that obviously means…well, nothing. It was actually quite creepy. But still, not boring. And so we must conclude: the only logical explanation for this lackluster episode, unfortunately, lies with its selection of contestants. Cowboy slash wrestler Casey Musicman makes a bid for singularity with his truly ridiculous last name (which is real, he swears!). He backslides, however, by singing “Sweet Home Alabama” and joining Blake’s team, as we all knew he must. In fact, the best part of his audition is the ten seconds before it even begins. Blake hears the footsteps and informs the other judges with a knowing grin, “Boots!” If this moment didn’t prompt NBC to greenlight a Southern version of Sherlock Holmes, I just won’t understand television anymore. Ryan Fogarty enjoys karaoke and being a production coordinator for Leann Rimes, who I was not aware still sang in between tabloid photo shoot appointments. I don’t remember what he sang, which is fitting, since I don’t remember most karaoke performances. He seems like a nice and determined guy, though, so maybe he will return next season to try and sway a chair. Half the contestants get the unfortunate "My name is _____, and here is my slow-mo moment of pain set to a plinking piano” edit. Aquile of San Diego is biracial and broke his jaw, once. He sings a smooth, John Legend-esque cover of “Your Song” that doesn’t set the room on fire, but the kid has an undeniable presence. 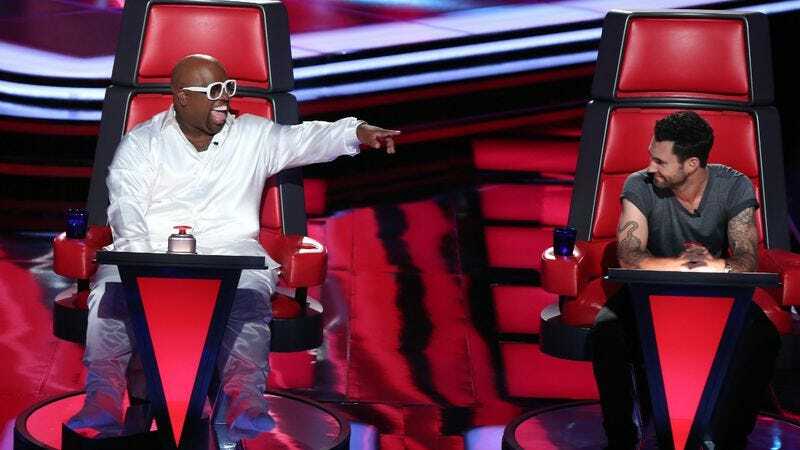 Adam compliments his technical skills and CeeLo tries to woo him with his usual “we can make music together” platitudes, but it's Christina who convinces him to join her team for a “private concert.” Good luck calling CeeLo a perv after that one, X-Tina! New York City bartender Adriana was held hostage with her family when she was nine. I think Carson speaks for all of us when he says, “….oh, God.” She tackles Jessie J’s romantic comedy theme “Domino” and gets every judge to turn around. I found myself agreeing with Adam, though, who pressed his button about as nonchalantly as he’s ever pressed it. As Adam almost explicitly says, Adriana has a great voice, but it's generically great. Adriana says the first album she ever bought was Christina’s, and so she, too, joins Team X-Tina. Nineteen year old Mackenzie looks like Justin Bieber crossed with Nicholas Hoult and once had all his organs shut down. Thus beat, the Montage of Tragedy retires for the night. Mackenzie plays an acoustic version of "Pumped Up Kicks" that is surprisingly bluesy and fun. To my monet, it’s the first real judging surprise when only CeeLo turns around. Finally we have Julio, a nervous mariachi singer who takes a gamble by singing the all-Spanish “La Bamba.” Blake hears the first verse, bursts into a grin, and becomes exponentially more endearing when he immediately turns around. He almost throws a fit when CeeLo turns at the last second, so taken is he with Julio and his letterman jacket, but he needn’t have bothered. Julio joins Team Blake, and we get ready for tomorrow's round of blind auditions, the third airing this week. To be fair, it’s a little hard to know how much of the fatigue is the actual episode’s fault rather than a fault of scheduling. If simple saturation is indeed the culprit, tomorrow’s extra extra hour will prove intolerable. Luckily(? ), it will only be a matter of hours until we know for sure. Depsite its insistence that appearance isn’t a factor, The Voice has mostly featured conventionally attractive people. That said, this season already seems much younger than the previous two. After two seasons of sitting in those chairs, are the judges just less trigger happy this time? Discuss. I get that Adam and Christina are trying to make fun of Blake by imitating his wiggling “pick me!” finger, but don’t they know that’s how it starts? Tomorrow: the Voice vs. X-Factor diva showdown you and every advertiser in America has been waiting for! I’ll try not to insult Jessica Jardine’s dye job, but you know, no promises.